I know that really and truly I should have posted this on Friday night so that you could try this for brunch over the weekend, but life has just been a little too hectic recently to be that organised with my blog (the blog really has fallen by the wayside a little recently!) Anyway, now you have it well in advance of next weekend, which we all know is a special weekend! Yes, it’s Valentines, so no doubt you will all be serving your loved one a scrumptious breakfast in bed. Now you have your breakfast in bed recipe all ready to go! I called this dish “Breakfast of Champions” because breakfasts don’t really get much better than this in terms of taste and nutrition! 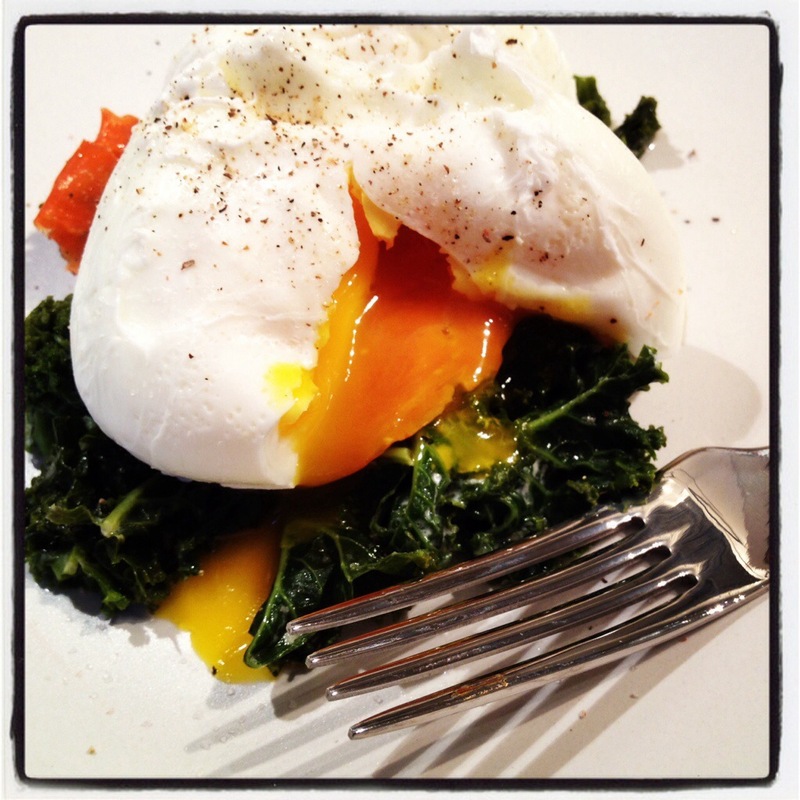 Organic free range eggs, smoked wild Alaskan salmon and creamy kale! It’s all in there. Just think of how your body loves taking in all that great stuff like omega 3, great quality protein, and the calcium, iron and magnesium from the kale. Believe it or not, this was also the first time I have ever made poached eggs in the old school way, as I was always slightly afraid of ruining them. It was easy and after testing the way with the first one, which wasn’t as attractive as it could have been, they came out perfect! Poach the kale in the chicken stock until tender (about 5 mins). Once cooked, drain remaining liquid. Add butter and cream cheese if using and stir until fully melted and incorporated. Cover and keep warm while you concentrate on poaching the eggs. Poach eggs according to your preferred method. I used a large saucepan with about an inch of water in the bottom. Bring the water up to a rolling boil and add the vinegar. Crack the egg into a ramekin. Stir the water to create a vortex and then gently tip the egg in while the water is still swirling (but you are no longer stirring it). Turn the heat down a little so you can observe the egg’s progress. Allow to poach for around 3 mins (or longer if you prefer it a little less runny). Carefully remove egg from water with a slotted spoon. Cook each egg separately to avoid disaster! Once all your eggs are poached, layer kale, then smoked salmon and finally the eggs on a plate. Season with Himalayan salt and freshly ground black pepper. Posted in Breakfast, Uncategorized and tagged chicken stock, eggs, fish, gluten-free, grain-free, grass-fed butter, kale, low carb, organic, paleo, poached, primal, real food, smoked salmon, whole-food. Bookmark the permalink.